Continuing with our sub-collection of Alice Waters books, book number 4 is The Art of Simple Food II: Recipes Flavor & Inspiration from the New Kitchen Garden. We have both volumes of Alice’s Art of Simple Food, and have several go-to recipes from volume I (coming up as book 5), but, inexplicably, neither of us had ever cooked anything from volume II. This book focuses on vegetables and, in contrast to volume I, which has recipes organized by cooking technique, this one features recipes and techniques organized by type of vegetable. Since we had a bunch of beautiful parsnips from the Midcoast Winter Farmer’s Market in Brunswick and a bunch of freshly harvested sage from our Leaf & Caul meat CSA box, we decided to put them to work in a batch of Parsnip Soup with Sage and Toasted Walnuts. I’m sure that I must have eaten parsnips at some point in the past, but I really feel like I have just discovered them this fall in Maine. 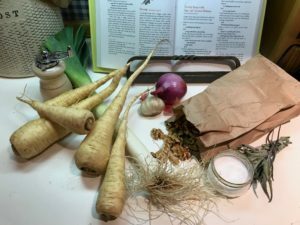 Related to carrots, but more subtly flavored and starchier with an intoxicating perfume, parsnips have been a regular component of our weekly roasted chicken and root vegetables the past few months. Similar in texture to a chunky leek and potato soup, but with the natural sweetness and perfume of the parsnips, this hearty soup is enriched with the addition of a spoonful of fried sage and toasted walnut pesto just before serving. 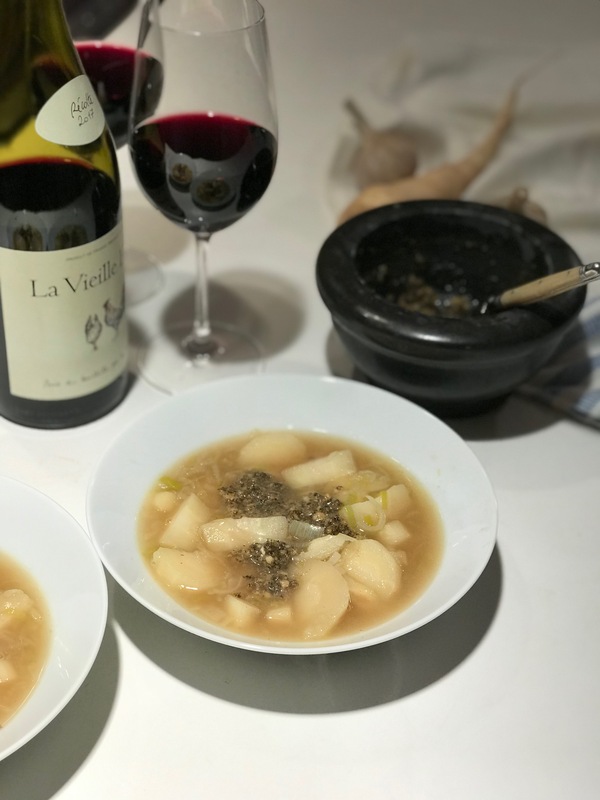 The soup started with sautéing thinly sliced shallots in butter until they softened and then adding the sliced white of a leek, a sprig of fresh sage and a sprinkling of salt. After a few more minutes, peeled and chunked parsnips went into the pan to sauté for several minutes before adding chicken broth and simmering until the parsnips were tender. Meanwhile, we toasted walnuts in the oven and crisped a handful of sage leaves in olive oil. When the sage was crisp, we tossed the toasted nuts with the oil and sage and seasoned them with kosher salt and freshly ground pepper. Along with a few cloves of garlic and some olive oil, we pounded the sage and walnuts in a mortar and pestle to make the chunky pesto that garnishes the soup. Total cooking time was only about half an hour from start to finish, but the flavor and aroma were amazing. It was rich and satisfying without being heavy and was the perfect dinner for a cold night. The leftover soup was also spectacular a few mornings later with a runny fried egg on top. So far, I have to say that we’re batting 100 percent on these recipes. Up next: Alice Waters’ The Art of Simple Food: Notes, Lessons, and Recipes from a Delicious Revolution.